Did you know that Drill Team has been in existence since 1939? A woman named Gussie Nell Davis created the world famous Kilgore College Rangerettes in Kilgore, Texas. Yes, it was right here in Texas that it all began! Her dream was for a dance line to perform with beauty and precision during the half-time of football games in order to keep the crowds in their seats. She created so much more than that when she pulled together this first group of dancers. She created a place where one can belong and experience incredible opportunities. Her dream is still alive today in numerous dance/drill teams throughout the nation! 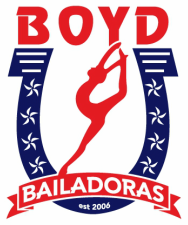 The McKinney Boyd High School Bailadoras Dance Team began, under the direction of Margaret Pearce in August 2006 with the opening of McKinney Boyd High. The Bailadoras are currently under the direction of Caris Dunn who joined the Bailadora organization as the assistant director in 2008 and became the head Director in 2009. The JV drill team, the Belles, was created in 2011 and has developed into a successful competitive JV Drill Team and a strong feeder into our Varsity program. The Bailadoras are the official Varsity dance/drill team of McKinney Boyd High School and are composed of Boyd’s most elite dancers. The Bailadoras perform at all pep rallies and varsity football games, as well as several varsity basketball games and events throughout McKinney. They also compete in the spring and put on a spectacular Spring Show. The Bailadoras have competed at Nationals 4 times, winning National titles each time. In their two most recent trips, in 2015 & 2016, they won the overall Grand National Champion Team & Officer titles! The team is very lucky to have such dedicated leadership and with the continued effort and hard work backed by an active and supportive parent group the team is poised to challenge new heights and records. Being a Bailadora is a year round commitment of long hours and complex routines and exacting standards, but the results reward everyone involved.